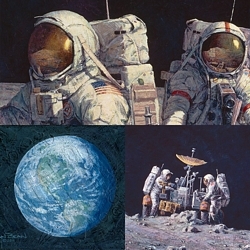 Image Size: 16"w x 11"h.
The Apollo 16 crew have just awakened from their first sleep period. The previous day had been a busy and exciting one for John Young, Ken Mattingly, and Charlie Duke. It began with a flawless launch on top of the mighty Saturn V, a brief orbit around the Earth to check out their Command Module, and a long burn of the SIV-B third stage to reach translunar injection velocity. Once on their way toward the Moon, they separated from the spent rocket, turned around and docked with the lunar module, and then pulled it away for their 240,000 mile journey to the Moon. Because they are exposed to harsh continuous sunlight on their journey between the Earth and the Moon, they have oriented their docked spacecraft with the long axis perpendicular to the Sun. The crew then programmed their computer to slowly rotate their two spacecraft so that the temperatures within them remain within acceptable limits. Charlie: Tony, you just went by my window, and that half Earth, man, is a spectacular sight. Tony: I bet it is. I'm green with envy. Charlie: Well, I don't want to trade with you. Tony: (With laughter) You say the world looked pretty good when it went by? Ken: How far out are we now, Tony? Ken: I think one of the most impressive sights, Tony, is the cloud formations you can see and the polar icecap. Because they are in the barbeque mode, John, Ken, and Charlie are seeing the Sun, Earth, Moon, and stars in a curious, yet strangely familiar way. It appears that the universe is revolving around them every seventeen minutes.